The personal feud between erstwhile confreres Bebot Alvarez and Tonyboy Floirendo has reached an ultimate point of irreconcilability. Both are incumbent congressman representing the two districts of Davao del Norte. Either of the two maybe would deny it, but I consider them my friends before and during the campaign period and after, meaning up ‘til now. Davao del Norte electorates celebrated they won as congressmen.. Mindanao celebrated with Davao. 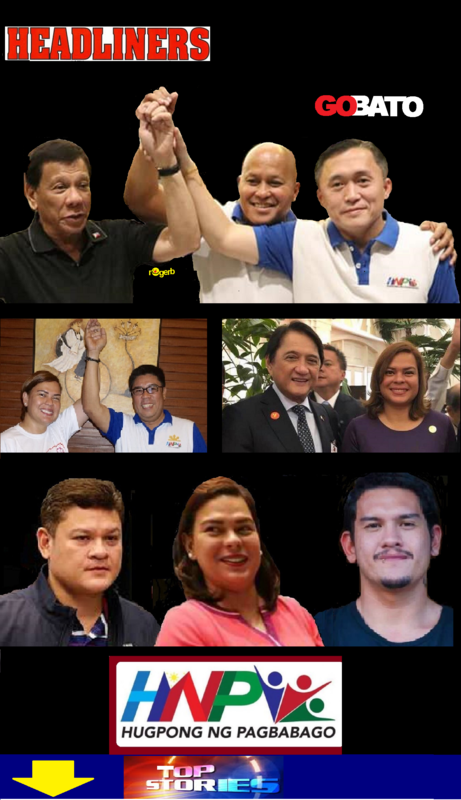 Davao City Mayor Rodrigo Duterte is President, Alvarez is Speaker of the House of Representative and Floirendo publicly known to be the biggest contributor to the Duterte campaign all made it to the highest notch of the totem pole of power. Let me say without reservation here that Floirendo also contributed immensely to the campaign kitty of his best friend Bebot. The three, Digong, Bebot and Tonyboy, were the enviable political triplets. They all are from Region 11 or the Davao region, and we, especially those from Davao del Norte, hoped that there will be additional bonanza up in the offing among them the elusive Samal-Davao City bridge, irrigation and potable water for at least seven towns of Davao province to be sourced from Saug river and additional infrastructures in the entire region. Will the triumvirate push these projects? What looked like an enduring friendship between Alvarez and Floirendo however suddenly snapped. It was not on account of their love for each other as friends but on account of the significant others in their lives. I hate to delve into the details because it’s too childish an issue to even allow decades of friendship ends as quickly as it began. Frankly, I was disturbed in disbelief for I cannot reconcile what I thought was a deep and meaningful relationship of the two thus I attempted to text the Speaker whether their differences can no longer be mended and, despite the information filed in the Ombudsman by Bebot against Tonyboy, still be reconcilable. “This has nothing to do with friendship anymore about friendship, this is (about) accountability to the nation”, the Speaker texted back. A week later, Sandiganbayan issued a warrant for the arrest of Congressman Floirendo for which he promptly posted a P30-thousand bail. I commiserate with Tonyboy but for now I cannot comment on the case. What infuriate me however are the events that followed. A phalanx of armed policemen, personnel of the Department of Public Works and Highways and several other unidentified men, stormed the Tagum Agricultural Development Corporation and by force dismantled installations in the quarantine gates where people pass through. The crew, based on published accounts, was headed by a certain Edwin Jubahib, said to be a chief of staff of Speaker Pantaleon Alvarez. If indeed this is not about friendship, and all about the alleged criminal liability of Tonyboy Floirendo for using his position as congressman before to persuade the Bureau of Correction to renew the Joint Venture Agreement with TADECO, then why should those biosecurity barriers that protects the banana plantations be dismantled? Maybe Speaker Alvarez was not aware of how the stupid officials of DPWH, the policemen and his nit-wit Chief of Staff destroyed those quarantine checkpoints. He should hold them accountable to himself. Those quarantine points are commonplace in banana plantations and in animal breeding places to prevent the entry and spread of deadly diseases. People and vehicles are not prevented from passing through these gates but they are required to comply with a simple process of stepping on foot-washes which are mixed with biocides that effectively eliminates pathological bacteria and virus. The devious order to dismantle the quarantine barriers was ordered by Rep. Johnny Pimentel who wants to have an inventory of public roads surrounding the Tadeco Plantation. The congressman from Surigao del Sur cannot even attend to the decrepit roads in his province, and here he is intruding into the roads in Davao del Norte and specifically in Tadeco. While I say that his motive is suspect, I put vital emphasis on the effects of this outrageous and deplorable act of placing Davao’s premier agriculture industry in unquantifiable damage. If these bastards think that only Tadeco banana plantation will be destroyed once the deadly Sigatoka disease and fusarium wilt spread they are terribly wrong. I knew for a fact that the entire banana industry had been struggling how to eradicate and control the spread of fusarium wilt. The soil-borne fungus cannot be controlled by fungicide and chemicals and stays in the soil for until when, scientists still are grappling for the answer. What the idiots in DPWH and the Philippine National Police did was to open the floodgates for these toxic diseases to traverse boundaries and infect other plantations. The threat of this foolishness is beyond politics and irreconcilable friendship. You are watching here the possible demise of an industry that is the biggest employer in the country. Tadeco alone has no less than 6,000 labor force and that is not counting the indirect small capitalists that derive income from the industry. We are seeing here the decline and then loss of precious dollar currency generated from banana exports. Who will suffer in the process? First the Davao region. The purchasing power of people and service sector cannot be belittled. Investment capitals are poured into the region because of the economic bonanza that is driven by its vibrant agricultural industry. Davao City for one has the distinction of sustaining a 9% economic growth possibly the highest in Asia. And we allow an ignoramus congressman from Surigao del Sur to diminish that because he claimed that there are two roads that have barriers in Floirendo-owned plantation? The bloke is even wrong. Tadeco is just a partner in the Joint Venture Agreement with the Bureau of Prisons in developing what was once a vast waste land to be the highest yielding banana plantation in the world. In retrospect, I see the sense and purpose of setting up a regional party – Hugpong ng Pagbabago. And having said that, I hope that the HnP leadership will question and repulse this veiled and diabolic attempt of strange political quarters from Surigao that undermine the banana industry in the Philippines. If this will fail, it is time for Pres. Rodrigo R. Duterte to intervene and he must do it pronto before it is too late. This is not the way to spur the growth of our regional industry. This is not the sinister manner to deprive employment for thousands of agri-based labor force. This is not the way to drive the hundreds of thousands to seek employment in Kuwait and elsewhere and suffer the indignities and death that could befell them. Please spare Davao region from the vagaries of politics. Please spare the banana industry. It is the only one we have.